Ottawa – The Armenian National Committee of Canada (ANCC) strongly condemns Azerbaijan’s unprovoked attempt of a subversive cross-border attack against the Armenian town of Chinari that took place during the early of hours of December 29th. The attack that comes a few days before the New Year, claimed the lives of three Armenian servicemen and once again proved Azerbaijan’s adverse approach towards the bilateral peace process. Though not unprecedented, Azerbaijan’s direct attack on mainland Armenia is a serious violation that threatens the political stability of the South Caucasian region and it is a direct violation of international law. Azerbaijan’s blatant penetration into the internationally recognized and sovereign territories of Armenia uncovers Baku’s latest policies of aggression and violence in the region. After the Azerbaijani provoked Four-Day War that took place earlier in April 2016, the OSCE (Organization for Security and Co-operation in Europe) Minsk Group co-chairs urged both sides to accept the installation of independently operated monitoring mechanisms along the line of contact, something that has been long advocated by the Armenian side. 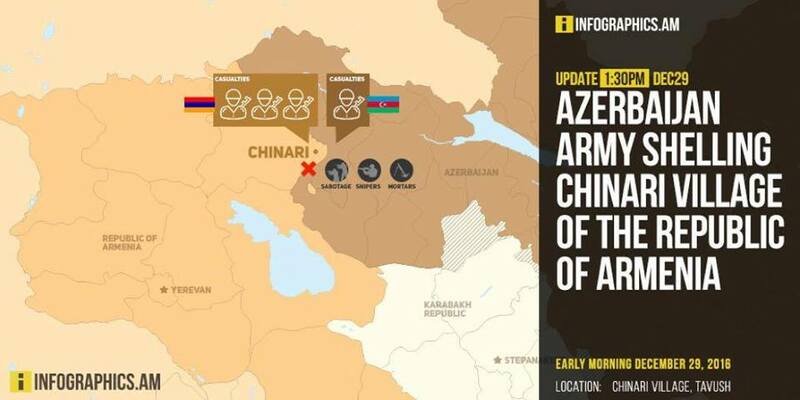 While Armenia has fully complied to the agreements reached in Vienna and St. Petersburg, in May and September of 2016, respectively, Azerbaijan continues to fail in upholding its promise, most demonstrably by the latest attacks in the town of Chinari of Armenia’s Tavush region. “Yet another unfortunate example that highlights the vital importance of establishing monitoring mechanisms along the Azerbaijan-Armenia/Artsakh (NKR) line of contact. It is only through the establishment of the monitoring mechanisms that the international community will stop yielding to the expedient tactics of Aliyev’s misleading policies and actively engage in the efforts to suspend further war crimes.”, said Shahen Mirakian, President of the Armenian National Committee of Canada. “We call upon the Canadian government, the OSCE and the international community to forcefully condemn Azerbaijan’s latest attacks and properly distinguish between the aggressor and victim” said Mirakian. Few hours after the attack, officials from Armenia’s Defence Ministry announced that all the regions that were subjected to Azerbaijani attacks were regained and the situation was neutralized. “Despite the fact that the Armenian side has regained control of all the affected areas, Azerbaijan’s bellicose attempts of aggression cannot remain unchecked. Unless these reoccurring attacks get properly addressed by the international community, Azerbaijan will continue to violate the terms and conditions of the ceasefire and seriously threaten the advancement of the peace process”, concluded Mirakian.